Secure Password Manager (Free) is well designed to let you store and track names, passwords, credit cards, software serial numbers and confidential notes in an encrypted form securely and easily. Secure Password Manager can autofill in your login information in any application (IE, Netscape, Opera, ICQ, MSN...). Secure Password Manager spares you the trouble of filling in your logins, passwords, and other personal information manually. ...... notes in an encrypted form securely and easily. 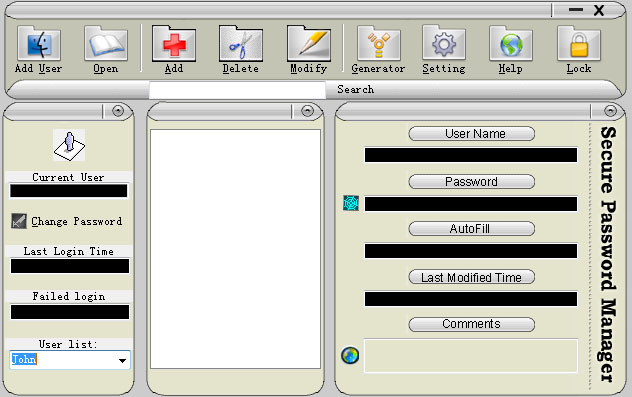 Secure Password Manager can autofill in your login information in any application (IE, Netscape, Opera, ICQ, MSN...). Don't let this password manager's busy interface scare you away. There's method to the madness, and Secure Password Manager proved easy to use. At first glance, the cluttered, compact interface is overwhelming. Packed with information, it sports a big toolbar over three panes. With the logical arrangement of the toolbar, though, most testers didn't need to refer to the Help file to get started. Qweas is providing links to Secure Password Manager 2.5.0 as a courtesy, and makes no representations regarding Secure Password Manager or any other applications or any information related thereto. Any questions, complaints or claims regarding this application Secure Password Manager 2.5.0 must be directed to the appropriate software vendor. You may click the publisher link of Secure Password Manager on the top of this page to get more details about the vendor.